Christian leaders use only a small portion of their female volunteer potential for several reasons. Some don't know how to intentionally and professionally develop and deploy women's talents and abilities. Others don't have the staff or resources. Then there are those who can't get past unfortunate cultural traditions and organizational systems that commonly leave women with the choice to either limit their potential or go outside their church or volunteer organization for training and then invest their skills elsewhere. 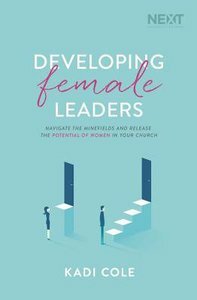 Developing Female Leaders by Kadi Cole is the book for leaders who face these challenges. Using contemporary interviews with and about women in key church and organizational roles combined with more than 30 years of research on the development of professional women leaders, the author has created eight easy to implement "best practices" that help accelerate a woman's organizational contribution. Thorough appendices and references make this book a one-of-kind publishing event. About "Developing Female Leaders: Navigate the Minefields and Release the Potential of Women in Your Church"
Kadi Cole, one of the first female leaders to serve in an executive role at a large, multisite church, is an international consultant for organizations, leadership trainer, and LifePlan facilitator. Kadi is a founding member of the Women's Executive Pastor Network and the founder of MinistryChick.com. She lives with her husband and son in Royal Palm Beach, Florida.Connect with Kadi at www.kadicole.com or on social media @kadicole.